California, like many states, is home to a large number of documented and undocumented immigrants and DACA recipients. Thus, the recent changes to our immigration policy has huge implications for our schools - teachers, parents, and youth. The California County Superintendents Educational Services Association (CCSESA) has developed an excellent report on the effects of the immigration policy changes on our public schools. 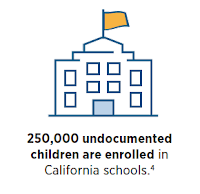 This report entitled California: Immigration & Inclusion in Schools has very little text, only infographics which makes it a powerful communications tool for educators and afterschool providers. Perhaps those in other states can identify similar numbers. What implications do these facts have on your program design and/or practice? With whom could you share this with (youth participants, program staff, school staff, parents, or others)?